Turn Up, Switch Off and Make a Difference! How is your Lent going? On Ash Wednesday evening I wished the congregation who joined me at St. Nicolas’ a ‘Happy Lent’! Not something we hear said very often, but I hope that your Lent is proving to be a joyful one. A time in which you have been able to draw a little closer to God and experience the joy of knowing His great love for you. As I write this, Lent is only just getting under way. By the time you read it, we should have reached Mothering Sunday (Lent 4) and feel that we are getting much nearer to the great celebration which this season prepares us for - the celebration of the proof of God’s love for us. The proof which is quite clearly shown in the gift to us of His Son, who sacrificed His life for us and who then rose again from the dead, so that we might share in His risen and eternal life. So during Lent we take the opportunity to draw closer to God as we prepare to celebrate Jesus’ resurrection. However, Easter Day cannot make any real sense without the events of the days leading up to it. We celebrate these in the Triduum, the three great Holy Days of Maundy Thursday, Good Friday and Holy Saturday. On Maundy Thursday evening we will gather at St. Nicolas’ around a simple table and be reminded of Jesus’ commandment to love one another, dramatically visualised in the washing of feet. We will then share in the Eucharist, the gift first given at the Last Supper. On Good Friday evening in St. Mary’s, which will have been stripped of all adornment, we will see the crucified figure of Christ on the Cross and respond to the call to worship. Finally, on Holy Saturday, we will celebrate the Easter Vigil, without question the most dramatic service of the whole Christian year. Darkness being overcome with the new light, as our Easter joy is proclaimed, our salvation history re-told, our Baptismal promises renewed and the first Eucharist of Easter celebrated. These three days are not to be missed! We look forward to welcoming Fr. Tim Raphael as our preacher for all three services and hope that as many of you as possible will be there, to bring Lent to a close and to celebrate the joy of the Resurrection! How do we ensure in our increasingly post-Christian society that we are helping others catch glimpses of the glory of God in the face of Jesus Christ? It is great to be commissioning the Local Ministry Team today in St Nicolas’ and St Mary’s. Local Ministry is a key part of our strategic approach as a diocese to the changing circumstances facing the church in the early 21st century. In part it is a response to a very different situation over the availability of full-time priests; a hundred years ago there would have been almost three times as many full-time priests in this diocese as today. But it is not just a knee-jerk pragmatic reaction to a problem; it is much more deeply rooted in changing theological understanding of the church and ministry. As the pilgrim people of God, we have to recognise that God is always calling us to explore new insights as we seek to make the good news of Jesus Christ known in a new cultural context and situation. There is a growing recognition that first and foremost in the pages of the New Testament ministry appears to be entrusted to the whole people of God; it’s the community of the church that is described in 1Peter 2 as a royal priesthood, rather than specific individuals within the church. Alongside the ministry of the whole people of God, there are clearly recognised leaders; it is never “either ... or”, but “both ... and”. The ministry of the whole people of God and recognised leaders. Local Ministry in this diocese is not just about lay people helping over-worked clergy; not simply about clergy delegating work to lay people; it is much more about lay and ordained Christians together in partnership taking responsibility for the life of the church, developing vision, ministry, mission. We are in it together. There is a flowering of gifts. Team members, including clergy, have a clear responsibility: not to undertake all the work of ministry and mission themselves, but by engaging willingly in ministry/mission to foster the gifts of the whole people of God. It’s a privilege to be with you today commissioning your ministry leadership team, and all of you as the royal priesthood of God here. May this new venture in your life together be a means of your discovering more of what it means to help others catch glimpses of the glory of God in the face of Jesus Christ, sharing together in God’s mission here in Prestbury. May God bless you richly as you serve Him, share in His mission, and make His love known in word and action. 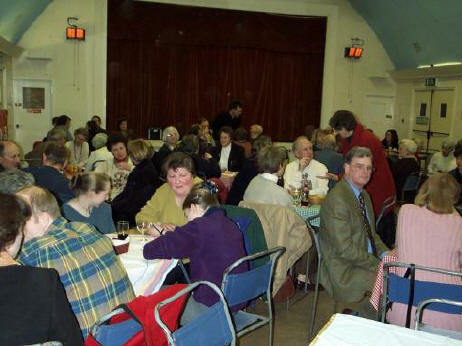 Eighty people took part in the Quiz Night in St. Mary’s Church Hall on Saturday 4th March. We had a very enjoyable evening with the ‘Cleeve Hill-billies’ taking first place, narrowly beating ‘HELP’, the team which included a certain priest with a liking for motorbikes! We look forward to repeating the event, although next time we hope for a little more Radio 3 amongst the music questions! Many thanks to Des and Rose for running the quiz (which we bought in, so they weren’t responsible! 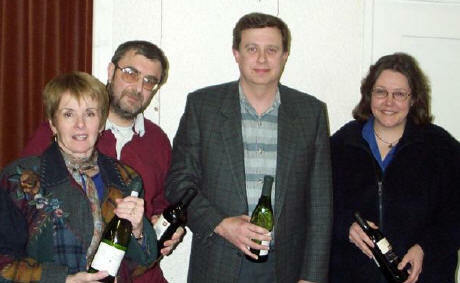 ), and also to Jackie for organising the ploughman’s suppers and to Hannah and Peter for the bar. The £300 proceeds were added to our collections for the Mozambique flood disaster appeal - thank you to all who came and took part! We hope to run two Confirmation groups; one for adults and one for young people aged 12 (Year 8) and above. These will need to begin in May, leading to Confirmation in November 2000. Please speak to Fr. Michael if you are interested. Only two names have been received to take part in the preparation of children aged 7 (Year 3) and above to receive communion before confirmation. Last Easter we admitted 15 children, so perhaps there aren’t any more, or perhaps you forgot to do anything about it! More information, or names please, to Fr. Michael. 1999 proved to be an exceptional year for St Mary’s. though St Nicolas’, in comparison with recent years, struggled to meet its budget for the year. Most Parish bills were paid promptly, and we were able to meet all budget commitments including £66816 for the Quota to the Diocese. A big thank you to everyone in the parish for their generosity in giving and serving in the past year. This total Giving Figure of £11746 would indicate that compassion fatigue is the one virus that escaped Prestbury in 1999. We hope this helps to explain the policy of Giving in the Parish. Saturday 11th September 1999 was a great day for the Trust. The annual sponsored Ride/Walk, in which 156 churches/chapels participated, raised £41,481. This averages £266 per church. In Prestbury as a whole we did better than that, £506 from St. Mary’s and £188 from St. Nicolas’, but came nowhere near the Challenge Shield winners, St. Edward’s, Evenlode, who raised £3,684! This year’s Ride/Walk is planned for Saturday 9th September. Start training now and let’s see how much we can raise this year. 13 May: Concert in Gloucester Cathedral (7.30 p.m.) by the St Cecilia Singers and King’s Junior School Choir at which Joanna Trollope will be appearing. 18 - 26 November: ‘In the Footsteps of Jesus’ - trek in the Holy Land. There is a free Quiz pack available to help you organise a fun evening to test people’s knowledge of the last 100 years and raise funds for the Society. If you believe that ‘Every child deserves a decent chance in life’ then you believe everything that the Society stands for. Following the success and enjoyment of last year’s event, it has been decided to send another group of people from the ages of 15 to 20 on the Alleluia weekend at St. Stephen’s House in Oxford. The times of the event are from Friday evening 12th May until after Sunday lunchtime 14th May, and the cost is £25 per person. If you would like to have some more details, please ask Fr. Paul. I’m a busy full time executive. I wear a suit to work and spend 5 days a week tied to a desk handling policy, personnel and practical problems. Stress is my middle name! Once a week though, I “go home on time”, change from my suit to a sweatshirt and realise that for girls growing up in Prestbury there are more pressing concerns than answering an e-mail or getting that all important presentation right. I’m a Guider. I’m not a “do-gooder” or a “goody-goody”. I am an ordinary harrassed, over-worked woman who thinks that being a friend and mentor to young people is something that really matters in this hurly-burly world. Becoming a teenager is not easy. There are pressures to conform, to dress in the latest style, to get good grades at school, to cope with the pace of the modern world and make life-changing decisions when some mornings you don’t even want to get out of bed. Guiding provides a space so that girls can explore, experiment, laugh, get dirty and have a go at things they haven’t tried before. The girls learn for themselves about how to work in a group, achieve something difficult or make a difference to someone else, sometimes putting their own wishes last so they can help another girl do something really special. A Guider is a facilitator not an expert, she has to be able to listen and communicate but more than anything, she has to be able to suspend reality - leave the job and the day-to-day concerns behind and be herself for a couple of hours. To be a Guider is to take responsibility for the well-being of the girls when they are with you, but the personal benefit is great too - it is also a huge pleasure to see girls blossom and achieve independence and confidence, knowing that you have been a little help along the way. I am leaving the UK this summer having had the chance to learn from many girls in this area. We desperately need more adults willing to give Guiding a try if we’re to carry on giving girls living near St Nicolas’ church this unique opportunity to develop and learn. If you want to turn up, switch off and make a difference, perhaps Guiding is for you. Interested? It is time for the Annual Easter Cleanup in the churchyard and this is on April 15th, the day before Palm Sunday. We need as many of us as possible, armed with any garden implements or willing to use the motor mowers and strimmer and also to barrow the rubbish to the skip. Morning is best (coffee will be provided!) but there will still be activity in the afternoon. There will be a chance to send off for a fish & chip lunch! Please come! We are still in need of someone to act as a link between the volunteer grass mowers through the summer. One vital task is to ensure that there is always petrol available for the machines. Is there someone who could just look after this aspect? Please speak to David Lyle or Ken Bradbury. The stream should soon be coming back to the churchyard! It is apparently not just a ditch but an official watercourse with the lovely name of “The Noverton Brook”. It is not entirely natural, being in part a “leet” or man-made watercourse. I imagine that its use was to divert the water flow into the mill stream which it joins opposite the Little Priory. This would have provided more water to the mill where the Marshes’ house is. However another story is that it was to provide water to the Priory when it WAS a priory. If that is true, then it was probably not drinking water, but for ‘ablutions’! According to the Council, the brook is blocked in the Idsal House area, due to problems with the trees and the wall. Before it became blocked, the Council had installed a “weir” higher up under the High Street so that if the flow became too great, then it overflowed into the main sewer. The blockage seems to have meant that the WHOLE flow has been going that way all the time, which would not please the water authorities. Work should have started on the 31st March, but it is not known how long it will take. I am preparing the new fortnightly rota for the flowers in St Mary’s church for the High Altar and the Side Chapel. I presume that those already on the list are happy to continue. If anyone else would like to be included, or others feel they would like to make a change, please let me know as soon as possible. Our Annual Meeting will have to be arranged too - so watch this space for news of the time and date. Spring is on the way! This month’s musician is Chris. The French horn is a brass instrument and has 7 metres of tubing. It is the hardest instrument there is because you can blow different notes by changing the shape of your mouth. I play in the training band and the wind band at Cleeve School. I have been playing for 1¼ years. My favourite piece of music is Joseph and the Technicolour Dreamcoat which I played in a concert with windband. I like playing it because it is loud. The Hall and kitchen are now registered with Cheltenham Borough Council for use by a Play Group and are, therefore, subject to the Environmental Health Regulations, which include periodic inspection. The Environmental Health Department have kindly provided two posters, which, together with a Health and Safety Notice, are on a wall in the kitchen. They cover such things as personal hygiene, tidiness, food preparation and handling and storage procedures, based on good practice and common sense. A requirement of the Regulations is that ALL users of the kitchen are now asked to study the Notice and posters and comply with the relevant parts. Please take the time to read the information before you next use the kitchen. Dig out your head-band and beads to re-live those days of flower-power, or maybe experience them for the first time! twist the night away or just listen to your favourite songs from our very own all-star live band The Blue Diamonds. So be there or be square at St Nicolas' Hall on Saturday 6 May. Watch for details of tickets in the notice sheet soon. £1400 was raised at St. Nicolas’ during Gold Cup Week. Many thanks to everyone who helped with coffee-making and car-parking. Several of us find these daily Bible reading notes very helpful. There are two versions: New Daylight, in which a short passage from the Bible is printed for each day, followed by a commentary and a prayer or reflection; and Guidelines, which does not print the Bible passage, in order to make room for more detailed comments. The notes are produced three times a year, in May, September and January, and a year’s subscription costs £8.55. If you would like to begin subscribing in May, or if you need further information, please contact Peter Brown at St. Mary’s or Paddy Spurgeon at St. Nicolas’. Now that a wonderful fixture in the Parish Calendar, the Annual Parish Dinner in January, is sadly, for various reasons, no more; before the memory of it fades, may we, doubtless with many others, pay tribute, albeit belatedly, to all those who made this unique event possible. Cheerfully giving of their time and talents, year after year, at a very busy season, this admirable team provided a brilliantly organized and executed festive evening, including a fun entertainment, for young and old alike, seemingly without effort, but actually involving varied and tireless work, behind the scenes. So, thank you for all the pleasure you gave, in every way! Term ends on 6th April, and then we have a month off for Easter. Next term will start on Thursday 4th May. If there are any pianists who would like to join the rota, please ring me. Rockers began in June 1975. Here in the magazine last year I mentioned the possibility of organising a Silver Jubilee Reunion this summer, and asked people to contact me. There has been some response but not a lot - a few local ex-Rockers have expressed an interest; two others have written to me. I have therefore decided not to try and organise a big event. However, we shall celebrate our 25th birthday in the usual way on the appropriate Thursday afternoon in church, and we shall hold our annual Garden Party (weather permitting) near the end of term. Former Rockers, both children and parents, are very welcome to attend both these events, details of which will be available nearer the time. We have raised £300 for “Let the Children Live”. After the weekly service at 10.30am in St. Mary’s we meet socially for a cup of coffee and biscuits and we all usually pay 50p for this. This function started on 18th February 1999. What a wonderful result in one year. Thank you everyone for your support. It would be great to see some new faces there. Look forward to seeing you. Good Friday for everyone who will share the experience of the Passion Play, for its witness in the Town Centre, for all those involved … and for good weather! This is an important event in the life of our parish. will precede the Parish Meeting. Saturday 8th April 2000, Gloucester Cathedral, 10.00am - 3.30pm. This will be a day led by Angela Ashwin (author of ‘Heaven in Ordinary’), exploring links between our private prayer and worship in church. The cost is £5 per head. For more information, see the posters on the notice boards or speak to Fr. Michael. We continue to meet monthly and would welcome any newcomers. We pray for the needs of the parish and the wider world and would be happy to see you, please phone Beryl for directions. The dates of the next three meetings will be Wednesday 5th April, Thursday 4th May and Tuesday 6th June. in St George’s Church Centre, Brockworth..
Advance notice of a Missionary Evening to be held in St.Nicolas’ Church on Wednesday 10th May. At 7.30pm, Fr. Michael will preside at a Eucharist according to the South African Rite. The Eucharist will be followed by a talk, illustrated with slides, on mission work in South Africa. The talk will be given by a USPG representative. We support USPG with our missionary giving - come and find out what that money is used for!